The Australia Telescope Compact Array has been used to measure positions with arcsecond accuracy for 379 masers at the 22-GHz transition of water. The principal observation targets were 202 OH masers of the variety associated with star formation regions (SFRs) in the Southern Galactic plane. At a second epoch, most of these targets were observed again, and new targets of methanol masers were added. Many of the water masers reported here are new discoveries and others had been reported, with position uncertainties exceeding 10 arcsec, from Parkes telescope single-dish observations many years ago. Variability in the masers is often acute, with very few features directly corresponding to those discovered two decades ago. Within our current observations, less than a year apart, spectra are often dissimilar, but positions at the later epoch, even when measured for slightly different features, mostly correspond to the detected maser site measured earlier, to within the typical extent of the whole site, of a few arcseconds. The precise water positions show that approximately 79 per cent (160 of 202) of the OH maser sites show coincident water maser emission, the best estimate yet obtained for this statistic; however, there are many instances where additional water sites are present offset from the OH target, and consequently less than half of the water masers coincide with a 1665-MHz ground-state OH maser counterpart. Our less uniform sample of methanol targets is not suitable for a full investigation of their association with water masers, but we are able to explore differences between the velocities of peak emission from the three species and quantify the typically larger deviations shown by water maser peaks from systemic velocities. Clusters of two or three distinct but nearby sites, each showing one or several of the principal molecular masing transitions, are found to be common. We also report the detection of ultracompact HII regions towards some of the sites. In combination with an investigation of correlations with IR sources from the Spitzer Galactic Legacy Infrared Mid-Plane Survey Extraordinaire (GLIMPSE) catalogue, these comparative studies allow further progress in the use of the maser properties to assign relative evolutionary stages in star formation to individual sites. 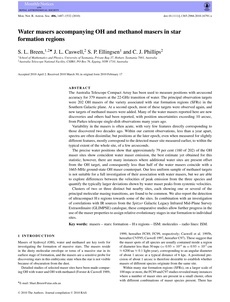 masers – stars: formation – HII regions – ISM: molecules – radio lines: ISM.